Watch: Vivek Oberoi Takes A Dig At His Infamous Fight With Salman Khan Over Aishwarya Rai Bachchan! Bollywood actor Vivek Oberoi had a hilarious reaction when asked about Tubelight Salman Khan at Bank Chor event. Remember how Salman Khan and Vivek Oberoi’s fight became a spectacle to watch for everyone after Salman made threatening calls to Vivek in 2003. Things went worst between the two actors when Vivek had organised a press conference at his residence against Salman Khan where he had said that Salman had threatened him. Many times, Vivek had tried to move on and had apologised Salman Khan publicly, but the Bajrangi Bhaijaan star paid no heed to his apology. The duo avoids coming face to face and even avoids talking about each other. However, this time it was quite different. Yesterday, the ‘Bank Chor’ makers hosted an event, where Riteish Deshmukh and Vivek Oberoi were set to get roasted by the journalists. Vivek, who plays a role of the cop was questioned something that hinted about Salman Khan. A journalist quizzed him asking do you like Tubelight’s (referring to Salman Khan’s cop act in the ‘Dabangg’ franchise) cop stint? “Yeah he does it very well and when part three (of Dabangg) will come I will go and watch it,” he continued. While beginning the roast session, and promoting the song ‘Lag Gaye Tashreef,’ Vivek himself took a dig at his infamous fight with Salman Khan. At the event, Vivek said, “(Tashreef toh tab lag gaye the) I was roasted then itself when 14 years ago I’d called for a press conference. The ones who didn’t get this line are ‘Tubelights”. This was surely a hilarious one and moreover, it was amazing to see how sportingly Vivek reacted to each question on Salman Khan and Tubelight. To people who are unaware of the infamous fight with Salman Khan and Vivek, let us reveal it all started on 31st March 2003 when Vivek Oberoi called a press conference claiming that Salman Khan had threatened him for getting close to Aishwarya. Those days were full of turmoil in Salman and Aishwarya’s lives and Salman could not take that. As both of them had hit a rough patch, Aishwarya was kind of fed up with her obsessive beau Salman, she saw comfort in Vivek. This had created a huge fight between the two actors. 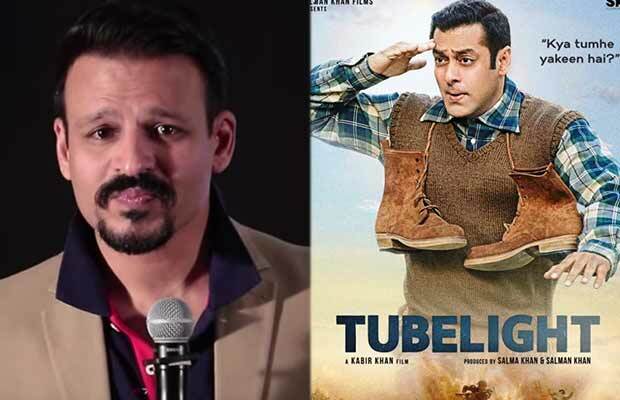 Watch the video below: Vivek Oberoi’s Hilarious Reaction When Asked About Tubelight Salman Khan! Previous articleBox Office: Sachin: A Billion Dreams Witnesses A Strong Monday!